Fifty lives were lost and some 200,000 houses were damaged by the earthquakes which occurred in Kumamoto Prefecture on April 14 and 16, 2016 with intensity of 7, the highest level on the Japanese seismic scale. More than 180,000 people were evacuated and there were many cases of disaster-related deaths due to the stress from living in shelters and the aggravation of chronic illness. 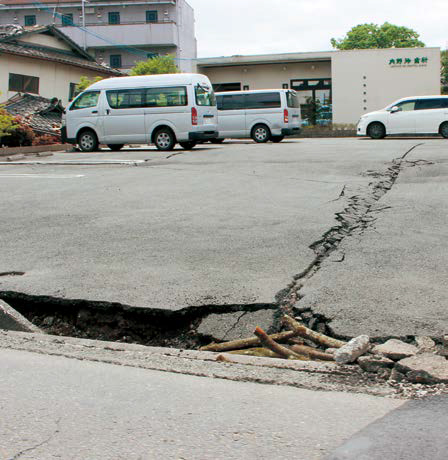 JVC conducted on-site surveys soon after the disaster and carried out emergency relief works through an organization based in Kurume city of Fukuoka prefecture, dispatching certified care workers to nursing homes for the elderly in Mashiki-town. Care workers were dispatched 41 times, with a total of 91 workers being sent to three nursing homes in Mashiki-town during the assistance period. As a result of the earthquake and the subsequent evacuation, there was an increase in the number of people unemployed. Additionally, there was a persistent shortage of local care workers as they were also victims of this natural disaster. The dispatched care workers provided support services such as watching over the elderly and assisting them with meals. Periodic dispatching of nursing care specialists helped reduce the burden of nursing home staff, allowing staff members the time to deal with their emotions and feelings.